Today's featured Yaob Sunday crafter (=your artwork on my blog) is my fellow High Hopes Rubber Stamps Design Diva Lacey Stephens from Hand Stamped By Lacey. Heute möchte ich euch meine High Hopes Design Team Kollegin Lacey Stephens von Hand Stamped By Lacey als Yaob Sunday Bastlerin (=Euro Kunstwerke auf meinem Blog) vorstellen. Lacey used sketch #37 for this funny and stylish card. I instantly fell in love with the way she interpreted the sketch (especially the borders with the fibres). The image is from High Hopes latest release called Sm. Ace. 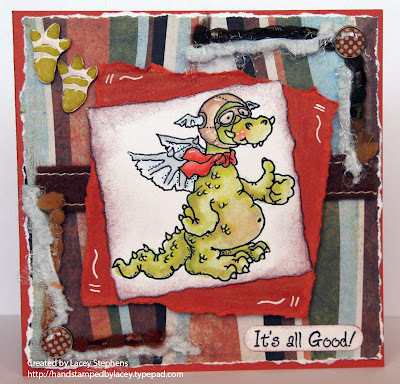 The dragon footprints and the sentiment are also from High Hopes Rubber Stamps. Please hop over to Lacey's blog and enjoy her beautiful colouration style combined with fun layouts. Thanks Lacey!! Lacey hat Sketch #37 für diese lustige und modische Karte verwendet. Ich bin sofort verliebt gewesen in die Art wie sie den Sketch interpretiert hat, vorallem die fasrigen Bänder sind ein wahrer Hingucker. Das Motiv ist von dem letzten High Hopes Rubber Stamps Release und heißt Sm. Ace. Die Drachenfusspuren und der Text sind ebenfalls von High Hopes. klickt euch doch mal zu Lacey's blog durch und genießt ihre anderen tollen Werke. Danke Lacey!! I am sorry to have to inform you that Whiff of Joy DT member Inge from the Netherlands had to withdraw from her position because of serious health problems. We will miss you deeply Inge and wish you all the best for a speedy recovery. Thanks for all the fabulous inspiration you provided over the past months!! Die schlechte Nachricht des Tages ist, dass Whiff of Joy DT Mitglied Inge von den Niederlanden auf Grund gesundheitlicher Probleme von ihrem POsten zurücktreten mußte. Wir werden dich furchtbar vermissen Inge und wünschen die alles Gute und eine schnelle Erholung. Danke für all die Inspiration, die du uns in den letzten Monaten geliefert hast!! Die gute Nachricht für heute ist, dass ich euch noch heute Abend eine Vorschau auf das Whiff of Joy Frühlings Stempelkit, designed von der wundervollen Elisabeth Bell, zeigen werde. Die Vorbestellungsmöglichkeit startet dann direkt nach meinem Post. I love Lacey's card; she has fabulous texture on it. Sorry to hear about Inge and I hope that her health improves soon. Looking forward to the new stamps (very excited!). Off to remind people on my blog now. I have been refreshing your blog all day! I can hardly wait to see the sneak peeks. I also wish Inge a quick recovery. Lacy's card is fabulous! I love it. I did read about Inge's health problems on her blog, to bad she had to withdraw from the design team, she makes gorgeous cards. What a fabulous card, I love Lacey's work and this is so well deserved. I was so sorry to hear about Inge, I do hope she will make a speedy recovery. Gorgeous card from Lacey! The colouring is great and every little detail and embellishment on her card are great too. So sorry to hear about Inge. I will hop over to her blog to wish her all my best for a speedy recovery. I will put the banner on my blog, but don't want to enter the prize draw. I don't know how I missed this post! I saw the post before and after, but missed this one!! Thank you so much for showcasing my card and blog! I am so honored! I have to run, I have to hurry and finish a card for the WOJ challenge #13 which goes with your "bag topper" challenge so I need to get them photographed and posted. Thanks again!